Apple iPad 2 on Way for Christmas? According to a poll by Cooper Murphy Webb, the copywriters, Apple's åiPad is the preferred method of reading newspapers and magazines among consumers already owning the device. 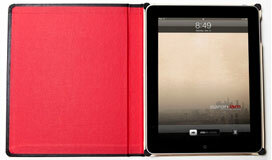 The poll also found that a plurality of iPad owners prefer the device for reading books and gaming. 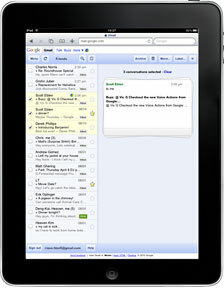 1034 UK iPad owners were questioned via a research-administered telephone poll between July 28, 2010 to August 10, 2010. PR: Americans prefer to make a list and check it twice to stay organized, according to a recent national poll that found nearly two-thirds of those surveyed use wall calendars or checklists to stay organized while only one-fourth use electronic devices, according to the Operation Organomics Survey, developed by Smead, which also found that Americans are 85% more likely to do the things that are listed on a 'to-do' list and a majority of Americans (72%) use checklists at least once a week (28% use checklists 2-3 times per week; 23% use checklists daily; and 21% use them once a week). Smead is a leading national provider of filing and organizational products. "While Americans have embraced technology in many areas of their lives, they have yet to make the switch when it comes to keeping up with everyday activities such as shopping, vacations, school activities and life events," said Michelle Santaferraro, a professional organizer who works with Smead. "For most, the process of checking something off a list offers just as much satisfaction as completing the task." Specifically, the survey found that 35% of those surveyed use wall calendars to stay organized; 28% use checklists; 26% use electronic devices and 11% use a filing system. It also found that women were much more likely to use a wall calendar (41% of women respondents versus 29% of men), while men were more likely to use electronic devices (32% of male respondents versus 21% of female respondents). The Smead Operation Organomics Survey also examined the time of year that Americans feel the most stress to be organized and found the holiday months of October - December ranked highest with nearly 50%. However, the second most stressful time of the year was a tie as 20% of Americans chose April - June (spring cleaning/end of school/summer planning), while another 20% chose January - March (New Year and tax time.) July - September received 11% of the vote. Interestingly, men found the time period of January - March to be more stressful than women; women found October - December to be more stressful than men. The survey also found that if given the choice, Americans would organize their bills and important documents first (55%), family schedules second (13%), home office third (12%), school work and projects fourth (11%), and photos fifth (10%). Operation Organomics is a new effort, led by Smead Organomics, dedicated to helping people get their lives organized. Operation Organomics will kick-off in September and will offer monthly practical ideas and advice including the latest trends and solutions to common organizing challenges. The Smead experts will teach people how to organize anything in three simple steps, and include monthly topics and projects on blogs, online community forums, Facebook and Twitter. In addition, Operation Organomics will provide practical checklists on Smead Organomics, a free interactive "how to" web site that can identify a person's organization style and offer tools to match that style. The web site also provides an "Organomics Calculator" that calculates actual time and money lost to individuals and companies due to disorganization. The online survey of 1,000 adults age 18 and older was conducted June 18-June 22 by eNation. To find your personal organizing style, visit Smead Organomics. "While the iOS 4 update brings a number of enhancements to the iPhone 3G as well as the iPhone 4, a few iPhone 3G owners have had enough problems that they want to restore the phones to their original states. There are ways to try resetting and restoring the new operating system to get it working, but sometimes the easiest solution is to downgrade. "Unfortunately Apple does not provide a supported way to downgrade its operating systems; however, with the iPhone 3G specifically there is a utility that enables this when coupled with the iTunes 'Restore' function. "Here's how to do it...."
DigiTimes' Monica Chen and Joseph Tsai report that according to their industry sources, Apple plans to launch its second-generation iPad, using 5.6" and 7" OLED panels, as soon as Q4 2010, noting that they're told Apple has recently placed new iPad orders to Taiwan-based component makers for Q4 2010 and Q1 2011 with 9.7", 5.6", and 7" models included. Chen and Tsai relay that the 9.7" model will see minor changes, while the new 5.6" and 7" iPads will mainly target the ebook reader market. Their sources also say that with Samsung Electronics and LG Display recently throwing heavy resources into OLED panel development, costs are dropping, and suggest that with Apple's premium brand image and high average selling price (ASP) the fruit company should have no problem adopting OLED panels into its devices, although they also quote DigiTimes Research senior analyst Mingchi Kuo pointing out that even the largest OLED maker, Samsung, has insufficient OLED capacity to supply the company's own handset products, and thinks OLED availability may not ease until the second half of 2011. Interpretation: Perhaps we should take these OLED iPad rumors with a big grain of salt. TechWorld's Dan Nystedt says Apple is readying another tablet similar to the iPad but with a 7" touchscreen for launch as early as the end of this year, according to a major Taiwanese newspaper, noting that this is the second report of an iPad 2 sighting in Taiwan. It comes from the island's Chinese-language Economic Daily News financial newspaper, which was among the first to correctly report that Apple was making a tablet when other news sources said it would be a netbook. "Analysts split today over reports that Apple may be readying a smaller iPad for launch later this year, noting that a story published Tuesday in Taiwan's Chinese-language Economic Daily News financial newspaper, says Apple is prepping a 7-in. iPad for a holiday launch later in 2010." 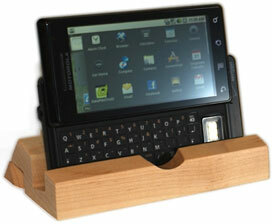 "The Motorola Droid 2 smartphone Droid 2 [sic], an Android smartphone, which Verizon Wireless put on sale last Thursday, is a prime example of how major US wireless carriers are trying to broaden the appeal of smartphones to business users and consumers alike by offering devices that have both touchscreens and physical keyboards." PR: Axon's new Haptic tablet computer gives you the choice of which OS you want to boot into - perhaps Linux one day, Windows the next, but the developers say they anticipate that you'll be using Darwin the most, and have installed the Darwin kernel and system specific kexts on a hidden EFI partition allowing users to easily install their favorite Darwin OS, such as pure Darwin. While Apple Inc.'s Snow Leopard is a "darling OS" (and a Darwin variant dontchaknow? ), unfortunately Apple's EULA specifically prohibits installation on "non-Apple branded" computers. The Axon Haptic tablet lets you connect via WiFi (a/b/g/n), CDMA 3G (AT&T and other GSM networks support claimed to be coming soon), and ethernet. You can also video chat with the front-facing 1.3 megapixel webcam, and the Axon Haptic comes with three USB 2.0 ports, an SD Card multicard reader, ethernet, a mic-in jack, a headphone jack, stereo output, a built-in microphone, and a VGA video port. Also, the Bluetooth can be used to hook up to a GPS, and there's 3G support as well. 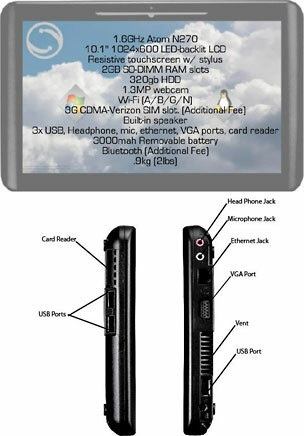 The Haptic display is a 10", 1024 x 600 resolution touchscreen unit. Input via the machine's built-in stylus or your fingers (even gloved). There's also upgradable RAM (2 GB standard in two slots), a standard 320 GB 2.5" laptop hard drive, and a user-swappable battery. 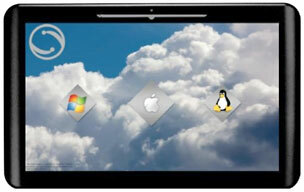 Powered by a 1.6 GHz Intel Atom N270 netbook CPU, The Haptic is expected to sell in the $750 - $800 range. PR: Here at Yahoo! we're focused on reaching consumers wherever they are - across PC, mobile, TV and increasingly across tablet devices like iPad. On the heels of our recently launched HTML5 mobile web mail for iPhone you'll feel right at home with this experience. We're keeping all the things users love about our new mobile Web mail, while optimizing it for the gorgeous large screen of the iPad. Faster and more reliable: If you're offline, Yahoo! Mail uses local caching capabilities to help you access and search your messages even without an Internet connection. Feature Rich: View rich photo attachments in their full form, or as previews directly in the inbox view. Also includes a dual-pane view to make reading and organizing a breeze. The new Yahoo! Mail experience is available globally to anyone who has an iPad. To check out Yahoo! Mail on your iPad, simply open up Safari and head on over to mail.yahoo.com. Of course this is just the first version, and we be constantly iterating to add new features, improve performance, and make Yahoo! Mail for iPad the best it can possibly be. And please let us know what you think. PR: In April 2009, we announced a new version of Gmail for mobile for iOS and Android. Among the improvements was a complete redesign of the web application's underlying code, which allows us to more rapidly develop and release new features that users have been asking for, as explained in our first post. Today's topic for the The Iterative Web App, a series where we continue to release features for Gmail for mobile, is the Stacked Cards Interface on the iPad. When we announced our new interface for Gmail on the iPad, we requested feedback on how we could improve this experience for tablet devices. In June, we responded with a new compose screen. Today, we're addressing the top feedback by launching a new "stacked card" interface for selecting and managing multiple conversations. In the past, performing actions on selected conversations was awkward. There were two similar toolbars on the screen: one on the bottom left and the other on the top right. The former affected the selected conversations, while the latter affected the currently open conversation. Since the toolbars' buttons looked similar, it was easy to mistakenly use the wrong toolbar. Sound confusing? It was. In the new interface, selected conversations are displayed stacked on the right panel for easy organizing, archiving or deleting. The second toolbar is gone so it's always clear which conversations you're working with. PR: Adobe has announced the immediate availability of Photoshop Express for iPad and iPhone. Formerly known as Photoshop.com Mobile, the newly branded application brings quick and easy photo editing, organizing, and sharing technology to the iPad. Photoshop Express for iPad delivers popular photo-editing features iPhone users have enjoyed, such as Crop, Rotate and Flip, as well as fun and eye-catching effects like Vibrant, Pop, Border, and Vignette. With one touch, adjustments to exposure, saturation, tint and black & white can instantly improve the look of a photo before posting to Facebook or sharing with family and friends. Photoshop Express also offers features specific for iPad users, such as the ability to easily change screen orientation from landscape to portrait views of photos, as well as redesigned workflows for organizing, editing, and uploading photos. For example, you can now edit multiple images in sequence, and then simultaneously upload each photo to Photoshop.com and Facebook. The new Organizer also simplifies album sharing. Adobe Photoshop Express for iPad and iPhone is now available worldwide in English as a free download from Apple's iTunes store. The iPhone application, originally announced in October 2009, includes minor updates with this release including its new name. Adobe has also released a Photoshop Express update for Android users, available on the Android Marketplace. PR: Prizmo for iPhone is an All-in-One Mobile Scanning & OCR Solution. The app scans documents, and applies a specific processing. The application costs $9.99, and a speech synthesis voice is available as an In-App Purchase for $2.99 (i.e. respectively €7,99 and €2,39). PR: The EFO Bluetooth keyboard is a credit card-sized analog 'board that can be easily carried in wallet or purse. It can also be used as a remote control for your smartphone or handheld device, for controlling music or video playback. 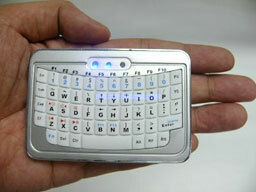 A special discount is offered for the Pre-launch booking of the new card size Bluetooth keyboard with the price of $32. The price will revert back to a normal of $40 once the product is normal shipped at early September. (Note: Additional software is required for iPhone 3 and Smartphone. iPad and iPhone 4 not required. 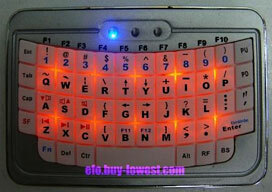 Backlit keyboard for comfortable operation in darkened room. PR: Xmultiple Technologies, Inc., a manufacturer of connectivity products, has released their iXP1-500 iPad adapter which solves problems iPad users have charging from their USB port on their desktop and laptop computers. iPad Charging with a USB port is in most cases not a feasible solution - The iXP1-500 solves this problem. The iPad has some cable charging issues which have not been fully resolved. There is a problem related the way the iPad charges with a computers USB port. Users of non Apple computer and some Apple computers cannot charge the iPad unless they use an electrical wallplate. The 10W Power Adapter which is packaged with the iPad is required if a user wants to charge the iPad. Therefore, to charge the iPad you have to be a slave to a wall outlet. Unless you have a 2.0 USB connector on your laptop or desktop which will operate with the iPad for charging. Apple states on their website that some USB 2.0 ports and accessories do not provide enough power to charge iPad. When this occurs the message "Not Charging" appears in the status bar next to the battery icon. This appears to happen in most cases. As it turns out the iPad will not charge through USB ports on non-Apple computers. iPad charges just fine through the wall-charging brick and accompanying USB data cable. The iPad charges just fine when connected to USB ports on iMac, MacBook Pro. However the non-Apple as a whole have a problem. The iPad does not charge correctly when connected to a PC. The iPad does not charge correctly when connected to an older MacBook Pro (pre-Unibody). 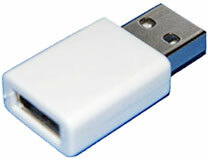 The iXP1-500 adapter has been designed to solve the USB power with an inexpensive solution. Simply attach the iXP1-500 adapter to your existing Apple charge/sync cable and your iPad will charge from your computer's USB port - Guaranteed. The iXP1-500 charges the iPad using the USB port on the users computer. No need for a wall outlet. No more frustration. The iXP-500 is packaged in a 2 inch by 6 inch blister packing design. XP1Power suggested retail pricing is $4.99. PR: Ah, wood; beautiful, natural wood. Crafted out of hardwood by local craftsmen. 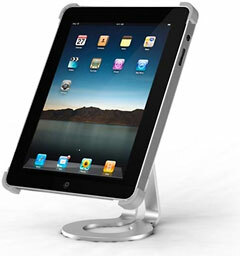 This clean, elegant stand supports landscape, portrait, and keyboard use. It is lightweight but stable. Sturdy as all get out. 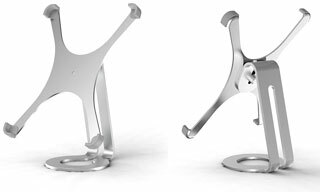 The hinged arm swings out for stability but folds into the stand for portability. Eco-friendly is the name of the game. Minimal packaging is used, and, each sale includes a donation to American Forests to plant a tree. Supports landscape, portrait and keyboard usage. 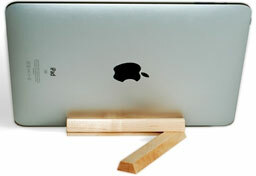 Non-slip rubber pads protect surfaces and iPad. For every purchase, $1 will go toward American Forests to plant a tree. 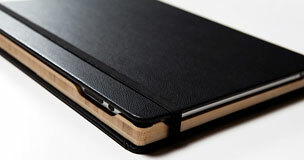 PR: The Dodo iPad case is made by an endangered breed, the San Francisco bookbinder. As the popularity of iPads, Kindles, and e-books grows many are lamenting the end of the traditional paper book. Dodocase is doing its small part to help protect the art of bookbinding from extinction by adapting the art form to a new niche, the iPad case. The Dodo iPad case is built by hand using traditional bookbinding techniques so it looks and feels just like a paper book. At last count there were only three commercial bookbinders left in San Francisco. 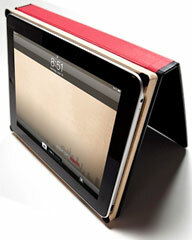 Dodocase is helping these last remaining San Francisco bookbinders rise from the ashes by making its iPad case locally. Gabi Hanoun, Owner of Cardoza-James Binding has been a book binder for 40 years and has witnessed first hand the fall of the bookbinding and print industry in San Francisco. "We started this business in 1958, and at our peak had 75 employees, but in the 80's and 90's we had to downsize because we lost a lot of business. 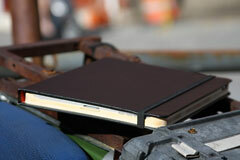 We were at five employees, including me, until we landed the Dodocase business." Now Cardoza and James is hiring with a staff of over 15 bookbinders. Gabi sees a bright future for his business and the bookbinding industry in San Francisco. He recently started teaching his daughters the family business so one more generation will carry the art of bookbinding into the future. If you love technology and books get yourself a Dodo iPad Case and do your part to save the art of bookbinding from extinction. The Dodo iPad Case is built using traditional book binding techniques by master binders in San Francisco whose mission is to protect from extinction while blending the beauty of tradition and technology. PR: Newer Technology, Inc. (NewerTech) announces that it has added nine new color choices to the highly acclaimed NewerTech iFolio custom handcrafted premium Brazilian leather carrying case for the Apple iPad. Previously offered in only Red and Black colors for $129.99 MSRP, NewerTech's nine new colors for the iFolio expands the protective case's style palette to 11 total to meet strong consumer demand for additional fashion complementing colors. The NewerTech iFolio is now available in Dark Red, Cream, Yellow, Orange, Lite Green, Dark Green, and Blue with a MSRP of $149.99; as well as two custom leather finishes, cognac and tan, with a MSRP of $179.99. All eleven iFolio color choices are available immediately starting at $99 from NewerTech's exclusive distributor, Other World Computing (OWC), as well as through the retail channel. Collapsible elastic-backed, double stitched leather handle. Removable double stitched leather shoulder strap (adjustable from 24" to 42"). Durable nickel-plated hardware to secure handles. Genuine USA Made YKK pull tab, and soft-touch nylon zipper. Elastic-backed, double stitched interior leather loop for writing or pointing device. 7" W x 10" H hard backed document sleeve. Two interior personal ID holders for business cards, debit/credit cards, etc. 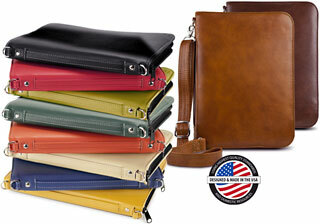 Non-marring, double stitched leather retaining straps allow full access to all iPad ports and functions. 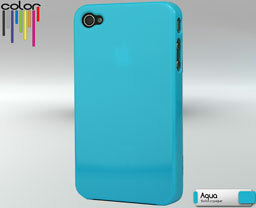 PR: Be smart this school year and protect your iPhone 4 with IvySkin Reception Case now in color offered at introductory price of $19.99. After much anticipation, IvySkin has just revealed the new COLOR Reception Case for iPhone 4. Featuring an innovative overmold color design, that incorporates crisp colors into the polycarbonate shell of the Reception case. The IvySkin Reception Case is a reception friendly way to guard and enhance the Apple iPhone 4. It is an ultra thin protection solution unlike any other in the market. Measuring in at a tiny 0.6mm thin, it is the world's thinnest iPhone 4 case. 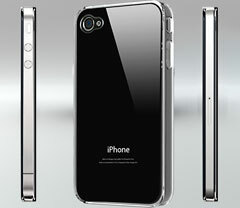 This clever solution conceals the new iPhone 4's built-in antenna that captures more of the available wireless signal and clears the internal antenna of your new iPhone 4 in a crystal clear case. The result is a clear signal, especially in border areas - which translates to fewer dropped calls, wider coverage areas, and faster downloads when browsing through your cellular connection. As the market pioneer in delivering enhanced Polycarbonate protection for digital devices, IvySkin continues to provide superior and cutting edge solution for the new iPhone 4. With the introduction of the world's first SmartCase for iPhone 3G/3GS, IvySkin continues to raise the bar. In the coming weeks, the all new Quattro4 and SmartCase will become available for the iPhone 4. The Reception case Color now available in 10 bright colors to liven up the iPhone 4: Phantom black, Avalanche white, USA red, USA Blue, Hot Pink, Aqua, Speed Yellow, Go Green, Pinkberry, and Platinum Silver. The package includes both front and back scratch-free body armors in addition to the Polycarbonate shell that snaps on the back of the iPhone 4. MSRP 19.99. PR: Hot on the heels of the highly anticipated release of Defender Series cases, OtterBox announces protection in a fresh new design with the Commuter Series for the Apple iPhone 4. "The iPhone 4 offers so many different custom features," says OtterBox founder and CEO Curt Richardson. "With Commuter Series cases now available, OtterBox lets users choose the case design that best fits their personality and style." The OtterBox Commuter Series offers three sleek layers of security to complement the iPhone 4's thin design. First, a self-adhering screen protector keeps the Multi-Touch display screen safe from scratches. Next, a silicone mid-layer absorbs shock, keeping the glass panels safe from bumps and shock. Finally, a polycarbonate shell provides added strength and helps the device slide easily in and out of a pocket or purse. Included with each Commuter Series case is a microfiber cleaning cloth and installation card for smooth application of the screen protector. 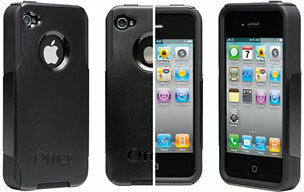 Give the Apple iPhone 4 fresh and stylish protection with Commuter Series cases from OtterBox. Or, if you're looking for extra-rugged protection, check out the OtterBox Defender Series to safeguard against all of life's mishaps. Impact Series cases coming soon.